PRETTY GOOD SOLITAIRE WINTER SALE - 20% Off This Weekend Only! 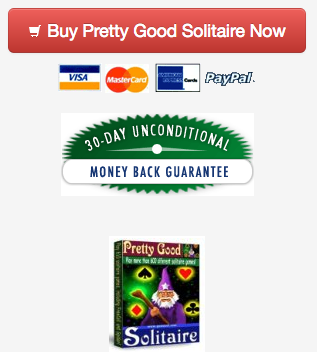 Pretty Good Solitaire (Windows or Mac) is on sale this weekend only - 20% off! Just order from our site with the coupon code WINTER to get a 20% discount off the regular price of the game. Coupon is good until January 31st. Pretty Good Solitaire version 16.3 for Windows has 930 games. 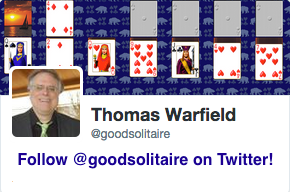 Pretty Good Solitaire version 3.3 for Mac has 700 games. Pretty Good MahJongg is our MahJongg solitaire game for Windows or Mac. Play 320 different classic tile matching layouts (a simple solitaire game with MahJongg tiles) and 55 different MahJongg solitaire games - solitaire games played with MahJongg tiles instead of playing cards. Action Solitaire is our fast paced solitaire game for Windows played against the clock. Play solitaire games such as Triple Peaks quickly in timed rounds for points. This game is at Fifteen Rush.